The first ever Beer inCider Experience is happening this weekend (21 & 22 September) at the Albion Park Raceway in Brisbane. There’ll be something for everyone – tasty local beers from near and far, wicked food trucks (including the epic Bun Mobile! ), great live music, and (hopefully) sunshine! Check out the extended press release mash-up below, get yourself some tickets, and I’ll see you this weekend. 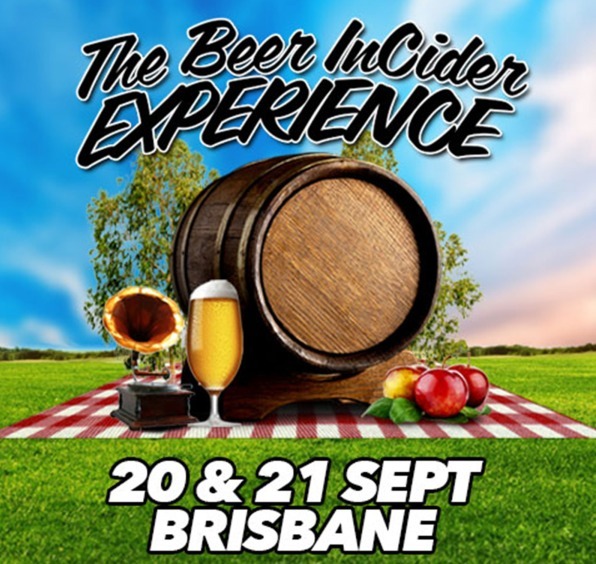 THE Beer InCider Experience, Brisbane’s official craft beer and cider festival, will feature 35 independent craft breweries, 130 beers and ciders, gourmet food, live music and burlesque on 20 and 21 September at Albion Park Raceway. All Inn Brewing Co, Amarcord Birra, Bacchus Brewing, Batlow Cider, Brewcult, Brooklyn Brewery, Brookvale Union, Cavalier Brewing, Clare Valley Brewing Co, Croft Brewing Co, Faire Ferments, Feral Brewing Company, Flying Brick Cider Co, Fortitude Brewing, Golden Axe Cider, Green Beacon, Holgate Brewhouse, Hills Cider Company, Kaiju! Beer, Killer Sprocket, Kooinda Boutique Brewery, Monteith’s, Mountain Goat, Nail Brewing, Napoleone Cider, Newstead Brewing Co, New England Brewing Co, Noisy Minor, North Coast Brewing Co, 4 Pines, Red Hill Brewery, Riverside Brewing Company, Rocks Brewing, Stone & Wood, Two Birds Brewing, Willie Smiths. The experience will give attendees the unique opportunity to meet and talk directly to each of the brewers and their representatives all while sampling their produce. Brisbane’s official craft beer and cider festival, The Beer InCider Experience will not only celebrate 130 beers and ciders but also delicious and local gourmet food. Among the action are three of Brisbane’s most-followed food trucks; The Bun Mobile, That BBQ Joint and the pizza Kombi Pizzantica. Among the beer and cider stalls you can taste fine gourmet fare from Dalton Hospitality and Peel St Kitchen. Killer Sprocket is teaming up with local legend Beerkary Bakery to celebrate the launch of their fourth beer Hey Juniper, resulting in a deliciously matched juniper-based sweet and savoury menu. For a VIP culinary experience, you can’t go past the Gourmet Tasting Lunches hosted by the Matt Kirkegaard for only $65 per ticket. If you’re looking for something meaty to sink your teeth into, market regulars Bald Rock Beef Jerky will have 100 per cent Grass Fed Australian beef jerky available too. The Beer InCider Experience will host a selection of local musical talent playing live sets over the two days. Headlining the bill is musician and songwriter Jack Carty who has toured Australia, played festivals such as South By South West in the USA and supported artists including Josh Pyke and Matt Corby. His performance at the festival comes just shy of the launch of his new album, Esk, on 26 September 2014. Karl S Williams, named after a criminal from the future, describes himself as ‘a guitar-slinging, banjo-wielding freak’ and will also perform at The Beer InCider Experience. Liam Gerner has been writing songs and performing since the age of 12 with sounds shuffling between genres of folk, pop, rock, jazz, blues and country. The Glorious North describes their style of music as ‘Slacker Country’ and punters at the festival can expect a ‘little bit of country, a little bit of rock’n’roll and a lot of swagger’ from this four-piece band. Hazlett describes himself as a singer, songwriter and soul searcher who will be fresh from performing at this year’s Brisbane Festival, and duo Intriguer will also perform as part of the live music entertainment. Whether you’re a beer connoisseur, a cider convert or a dedicated foodie, don’t miss out on tickets to this great event at beerincider.com/tickets2. Beer InCider Experience is Brisbane’s craft beer & cider festival, held on 20 & 21 September 2014 at Albion Park Raceway, and is about drinking local & drinking better. Glad you’ve still doing this blog.